We have a couple of items of important news and wanted you to be the first to know as it could affect you and possibly your performances or involvement at the next week’s festival. As you know the supply water to artists when performing is seen by us as a very important element of looking after you whilst at the festival but we feel compelled to do something toward this daft amount of un-necessary plastic that we throwing into the waste system. We currently throw away around 1500-2000 partly used water bottles in to the waste system each festival which is, to be honest, totally bonkers. So we are asking your help and there are a couple of things you can do with this. 1 Please bring a re-usable water bottle with you! You will be able to fill this free of charge in any one of outlets in the high street coffee bars and restaurants, via the water supplies in all the festival venues and our special water point in the park near the Big Top. 2 The other thing is to send the message on to all your folk friends, and others, to what we are doing. Posting or forwarding this on social media would be really helpful. As you will probably imagine, we have a number of suitable re-useable Chippfolk bottles for sale at our Festival sales. ! The other point on waste concerns changes to our recycling and waste management. We have for several years now been diligently separating our recycling as we only pay for actual non-recyclable material which is charged at around £130 a tonne. The waste company then still has to sort the materials back in their yard in order to ensure all recycled materials are separated correctly. This is sheer madness to be sorting waste several times and we are paying for that to happen. The method opted by the waste company is for us to place all the waste in 2 separate bags, Clear for recycling and Black for waste and just place them into single skips and compounds on the camp sites and on the main site in town. We will have some recycling Pods in the park as usual but our team of “Moles” will be doing the collecting and sorting as usual. Our request to you from the festival team, is just this. · If you are able to take any rubbish, you have generated over the weekend, back home with you and place them into your own recycling and waste bins that will help the festival enormously. · Please place clean recycling materials in clear bags and all other waste in black and ask anyone at the cabins or on site if you need more bags. Thank you and the Planet will thank you too. If you need to know more please contact us or our partners in the war on waste. 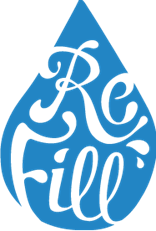 please go to the refill website to get their app. And go to Off the Ground to see where all the sites in Chippenham are to get free water.